A quick update on Retail Holdings (which I previously discussed back in January), despite general weakness in emerging markets and their underperformance this year, Retail Holding announced last week they are "considering" a potential IPO of Singer Asia (their primary asset) on Singapore's stock exchange. The IPO is probably in its early stages, but it continues to highlight management's intent to close the valuation gap between Retail's NAV and the market price, which has only barely moved since the announcement. Below is my updated valuation spreadsheet. 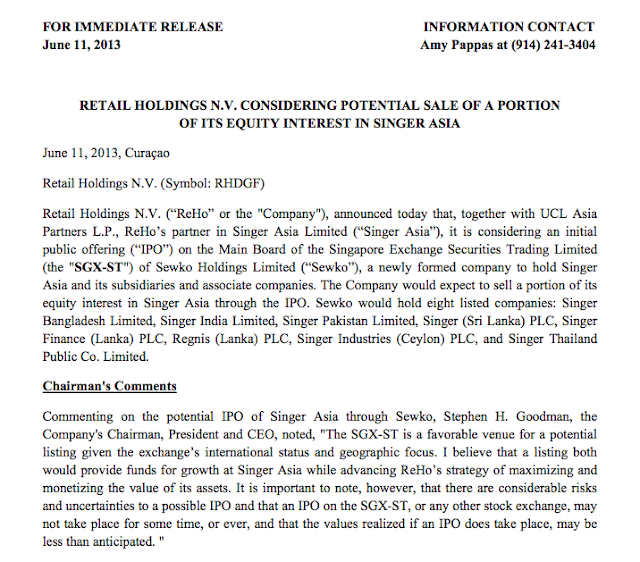 I added Singer Industries and Regnis as I mistakenly left them off before, Singer Finance is part of Singer Sri Lanka as far as I can gather from the annual report, either way they're small rounding errors. The investment thesis on Retail is pretty straightforward. Retail Holdings trades for a steep discount to its NAV and yet their stated strategy "is to maximize and monetize the value of its assets, with the medium-term objective of liquidating the Company and distributing the resulting funds and any remaining assets to its shareholders." Unlike other liquidations, Retail's assets are very much operating businesses that should grow and increase in value over time (playing off the long term trend of the growth of the middle class in emerging markets). Stephen Goodman, Chairman and CEO, owns roughly 25% of the shares and is in his late 60s, making him highly motivated to monetize Retail Holdings assets. I continue to hold and look for opportunities to pick up more shares, not easy given the illiquidity.